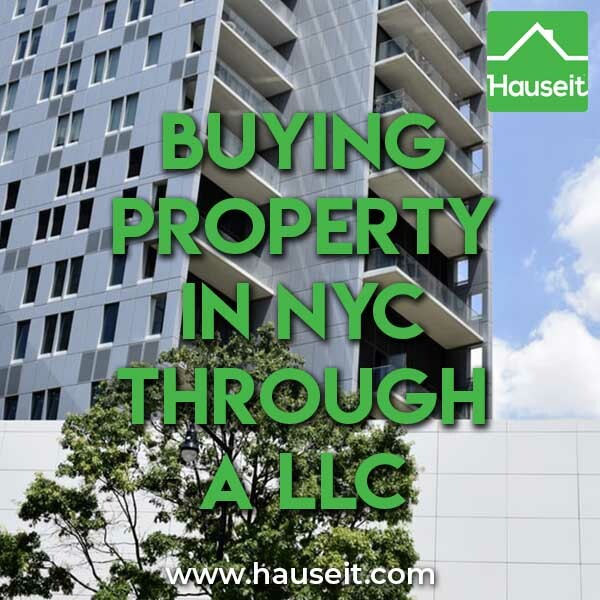 What are the pro’s and con’s of buying property in NYC through a LLC? Here’s what you need to know before you submit an offer. Why should investors consider buying property in NYC? Is buying property in NYC through a LLC a good idea? What are some drawbacks to buying property in NYC through a LLC? What are the steps to buying property in NYC through a LLC? New York City is widely known to be the world’s preeminent real estate market and remains the favorite destination for investors worldwide as a safe haven asset. On a macroeconomic level, New York City is even more attractive as an investment destination versus other major metropolises like London or Hong Kong due to recent geopolitical events such as Brexit negatively affecting London property prices and the increasing encroachment of mainland Chinese political control over Hong Kong. As a result, New York City remains the world’s freest, most cosmopolitan and safest megalopolis and easily the most suitable for property investment. Moreover, the real estate market in New York City is among the world’s most transparent, especially when it comes to apartment re-sales. Recorded sale prices and the names of the buyers and sellers are publicly available through systems such as ACRIS to the general public. Furthermore, public records and property listings are aggregated by easy to use real estate search websites geared for consumers such as StreetEasy, Brownstoner or Realtor.com. It depends on what your objectives are. If you are a celebrity or billionaire concerned about personal privacy, then yes a LLC will prevent your name from being recorded in public records and indexed by search engines. If you are a celebrity or someone whom the press is after, it’ll be extremely easy for even the most inexperienced investigative reporter to find out your home address and what you paid for your home unless it’s hidden through a LLC. Furthermore, if you are an investor with a large portfolio of other assets, it may make sense to shield your other assets from liability through a LLC. This way, in case a tenant or visitor to your property trips and falls and decides to sue you for an unreasonable sum, only that specific LLC will be liable in the lawsuit and your other assets will not be involved. Note: It may be simpler and cheaper to simply buy rental properties in your name and to purchase a personal umbrella insurance policy to cover against lawsuit claims in excess of what a traditional home owner’s insurance policy covers. The biggest drawbacks will be higher upfront and running costs, so you’ll have to really ask yourself whether it’s worth it to buy using a LLC. Set-up costs – you’ll need to spend up to several thousand dollars to set up the LLC, a registered agent and fulfill publication requirements. This is assuming you do this yourself using cost efficient providers. If you hire a lawyer to set the structure up for you, expect to pay significant legal fees on top. Running costs – you will have higher running costs from owning your property through a LLC, even if it is a single member LLC. You will have to pay yearly for a registered agent so that you can use their contact information in public records. If you will be owning the LLC with partners, you’ll need to pay additional yearly accounting fees for the company’s tax filings and K-1’s to partners. You will have recurring fees to the State of New York to maintain the LLC, and you may have the pay the Unincorporated Business Tax (UBT) if you reside in NYC. Opportunity costs – buying through a LLC means you’ll have to forgo the popular cooperative and condominium tax abatement which decreases property tax bills by 17.5% or more. That’s because New York City recently changed the eligibility for the abatement to only apply to properties that are primary residences and held in the actual owner’s name. Furthermore, you might have issues in obtaining financing from some lenders because of the LLC structure. However, other lenders won’t have an issue with LLC ownership as long as they can still underwrite you personally as the borrower, just like a normal mortgage. The search, offer submission, negotiation and closing process will be identical to the steps to buying a condo in NYC except for a few additional steps you’ll need to take to set up the LLC. Do I need to reveal my name when buying property in NYC through a LLC? You do not need to reveal your name if you are purchasing all cash and can show proof of funds. Your buyer’s agent will simply state that the name of the buyer is the LLC’s name. Since you will be showing proof of funds, you will want to have a bank statement that shows the name of the LLC. Alternatively, you can deposit the funds into your lawyer’s escrow account and have a statement from your lawyer showing that you are the beneficiary to your funds. Note: As of this writing, LLC property purchases above $3 million in Manhattan and $1.5 million in Brooklyn are subject to additional scrutiny by title companies to determine the identity of the owners. How do I set up a LLC to buy property in NYC? It can actually be quite affordable to form a LLC in the state of New York. Though much commotion is made about the cost of fulfilling the publication requirement in New York County (i.e. Manhattan), there is no requirement that you must file in a specific county. You should get started by reading the Department of State’s guide to forming a LLC. From there, you can easily file online in under 10 minutes for a nominal fee of $200, payable by credit card. You’ll want to be careful about putting your personal information anywhere on this form if privacy is a concern for you. The contact information you list for the Service of Process section will be listed on the Department of State’s public database and indexed by a plethora of third party websites, so many business owners instead put the name and address of their registered agent instead. A registered agent can be had for as cheap as $50 a year as of this writing. It’s important to have one so you can avoid having a personal address listed in a public database. You may wish to avoid this additional expenditure however if you plan on living in the property you are buying through a LLC. In that case, it may make more sense to just list the address of the property itself. Do I need an operating agreement when buying property through a LLC in NYC? You do not need an operating agreement if you are the sole owner of a LLC. In this case, the LLC is classified as a single-member LLC by the IRS and disregarded for tax purposes. You will need an operating agreement if you have partners in the LLC. You do not need to file the operating agreement with the government and the law is silent on consequences for not having an operating agreement in place. However, if you do have partners it is a wise decision to have an operating agreement in place to clearly detail the relationship and ownership between the partners. Should I have someone else be the filer? If you want maximum privacy, you can have a friend, your lawyer or other unrelated person be the filer when you file the Articles of Organization online at the Department of State website. If you do this, there will be no way for even someone digging through the Department of State’s record to be able to connect the LLC with you. You will need to have the filer sign an Initial Resolutions of the LLC stating that they are relinquishing all rights and ownership of the LLC to you. You will need this signed statement along with the filing receipt if you start a bank account for the LLC. Note: Keep in mind this does not mean you can hide your ownership from the IRS. You will be mailed a form from the IRS after you file asking you for the contact information and social security numbers of all members of the LLC. Furthermore, you will need to provide your identities to the bank if you wish to start a bank account. Why are the Publication Requirements of a LLC so expensive? What are the Publication Requirements Associated with the Formation of an LLC? Section 206 of the Limited Liability Company Law requires a copy of the Articles of Organization or a notice related to the formation of most limited liability companies to be published in two newspapers for six consecutive weeks. The newspapers must be designated by the county clerk of the county in which the office of the LLC is located. The newspapers charge a fee for the publication of the notice. The information in the published notice, including the name of the LLC, must match the Department of State’s records exactly as set forth in the initial articles of organization. The printer or publisher of each newspaper will provide you with an affidavit of publication. A Certificate of Publication, with the affidavits of publication of the newspapers annexed thereto, must be submitted to the Department of State, with a $50 filing fee. Failure to publish and file the Certificate of Publication with the Department of State within 120 days will result in the suspension of the LLC’s authority to carry on, conduct or transact business. Keep in mind that you are not obligated to file in a specific county such as New York County (i.e. Manhattan) which can cost significantly more than other counties further upstate. It can cost over $1,600 to file in Manhattan, however the cost can decrease to $300 or so in other counties such as Albany. While we advise you to follow the law and fulfill your publication requirement in a timely manner, per recent legal research it seems that there haven’t been cases of LLCs being punished or otherwise negatively affected by failing to fulfill the publication requirement. Extremely helpful for a first time investor deciding whether you really should purchase property in NYC in a LLC or whether it is just an over hyped idea. The last section which outlines the exact steps you will need to take is extremely helpful. You have saved me several thousand dollars on the publication requirement alone. Albany it is! Why Do Real Estate Agents Still Exist in NYC?